A couple of weeks ago, my Mrs. and I ventured to Halifax. 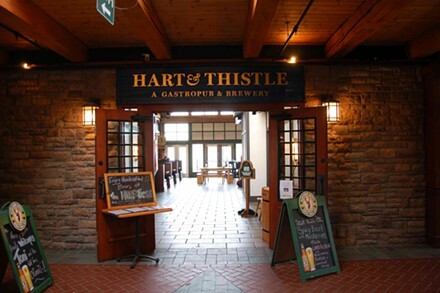 One place which I really wanted to try out was The Hart & Thistle. I was drawn, as you may well expect, by their own beers that they have on tap. I looked at the brewer, Nash's, blog, and he had a couple of beers that were described as being "hoppy as balls", which is something that sounded great in my books. Food-wise, I got to taste a few things. I had a bite of a prosciutto-wrapped Digby scallop, on a Pecorino peashoot purée and balsamic gastrique. It was good, but a bit squishy for a scallop. My mom's bacon-wrapped scallops were better in my opinion. My wife had a beet and goat cheese salad with baby spinach, pecans & balsamic fig dressing. It was most excellent. My main was the Thistle’s Bigger Burger. It is a beef patty topped with a BBQ’d Sweet William’s Italian sausage, peppered Havarti, lettuce, tomato, red onion & dill pickle. Overall, it was good. The burger itself was outstanding... fall-apart juicy and flavourful. We ended off with a sampler tile for dessert... it had homemade vanilla ice cream, a chocolate wedge the consistency between a ganache and a mousse. It was the favourite. It also had a great whipped cream that tasted like it had some peach juice or something mixed in. There was also a brownie on the plate, as well as a bread pudding, with some mint leaves and strawberries thrown around for good measure. Not a bad deal at $12! First, I started off with a glass of INK'D, an India Black Ale or Black IPA. It was, indeed, very dark / black. 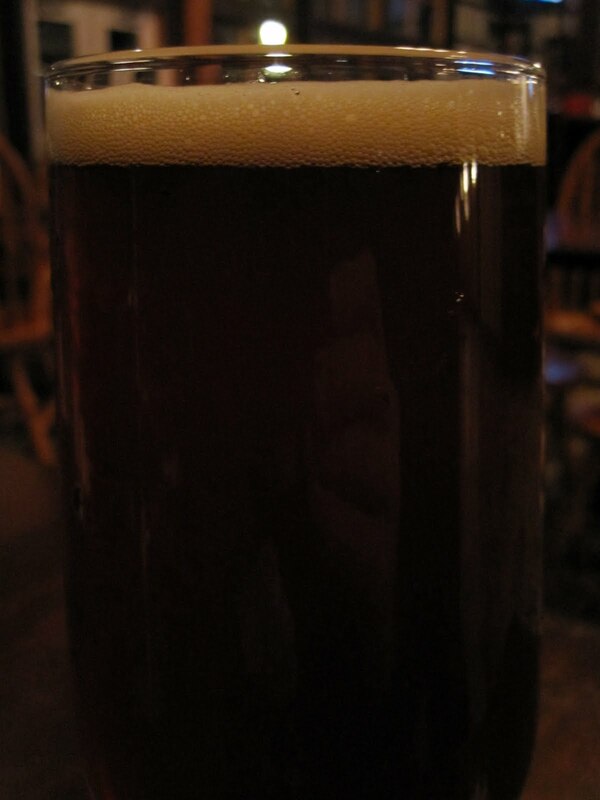 Towards the bottom, it had a brown, port-like hue. The head was creamy and somewhat tan in colour, with good retention. It laced from the top to the bottom. The smell was very fruity, like my favourite IPA's. There was orange peel, grapefruit, and date in the nose... and a bit of evergreen. The taste was more of the same... orange peel, and especially the grapefruit. There was a bit of a roasted quality to it. It was as bitter as some stronger IPA's, but the bitterness didn't linger too long. 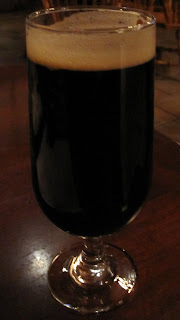 It drank smoothly with a medium body and light carbonation. Overall, very good! Easily drinkable, and pretty light. I finished off with a glass of 90 Degree IPA. It pours a foggy amber (just like the Halifax Harbour outside the window), with a bit of a rose tint (don't let the dark pic fool you). The head is low and white, and is gone fast. However, lots of solid lacing is given. There are smells of grapefruit, orange, and, if I'm being honest, a hint of something funky. The flavour is bright and citrusy, with flavours of grapefruit, lemon, and orange. There is a bit of a "burn" from the bitterness, but it's not overwhelming (84 IBU). It's airy, and has a nice aftertaste that doesn't linger for too long of a time. It was a very drinkable brew! I got a preview sip of this, too, which was tasting pretty great. I hope it's still around when I'm back in March! My Halifax acquaintance in beer, Chris, was there, as we arranged to meet up. I also ended up meeting his friend Brian, who won Garrison's first brew-off with "Harvey's Bitter", another chap, who he got the Garrison Spruce Beer from for me, and the H&T's brewer himself, Nash (also once brewer for Garrison, Pump House, etc.). A nice bunch of coincidences. Overall, I was pleased with the bill, the food, and especially the beers. I can't wait to go back.